It is hard to believe that summer is almost over! I am definitely not ready to go back in the next few weeks, but I am getting myself mentally and physically ready. As I begin the year, I always wonder what my students' levels of reading may be. We go back in mid-August but cannot assess until after Labor Day! That is almost three weeks that we lose. So, I use that time to work with the teachers and my students to conduct some simple and quick assessments, so I can start working with those students who need me the most. 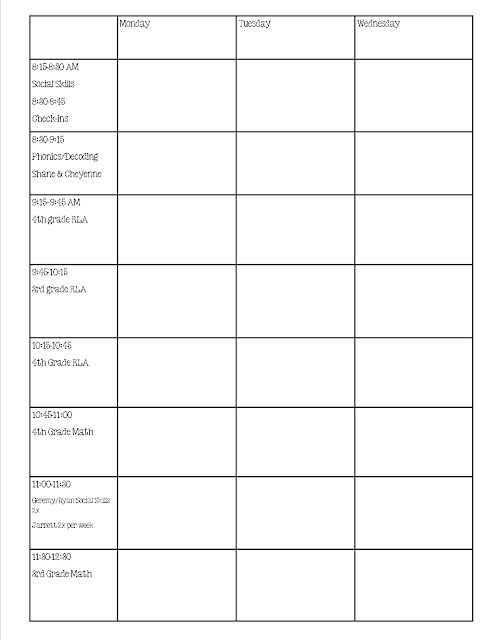 With students in grades 2-5, I can usually start off with looking at last year's end of year assessments and then go down about a year by using a running record. This gives me a good starting point. I like to use the QRI Qualitative Reading Inventory as a good running record tool. But, if I don't have access to that, there are many options for running records. You can create your own running record by finding a book at the level you want to assess and choosing a passage of at least 100 words from it. Have the student read the passage aloud and mark your copy as you go. Then ask the student to retell what was read to assess basic comprehension. The hardest part of my job is working with Kindergarten at the beginning of year. Why? Because we know very little about these brand new students. Many times we assess them based on what they do in the first few days of school and find that they are super shy or unwilling to work. By the second week of school, they are right on track! 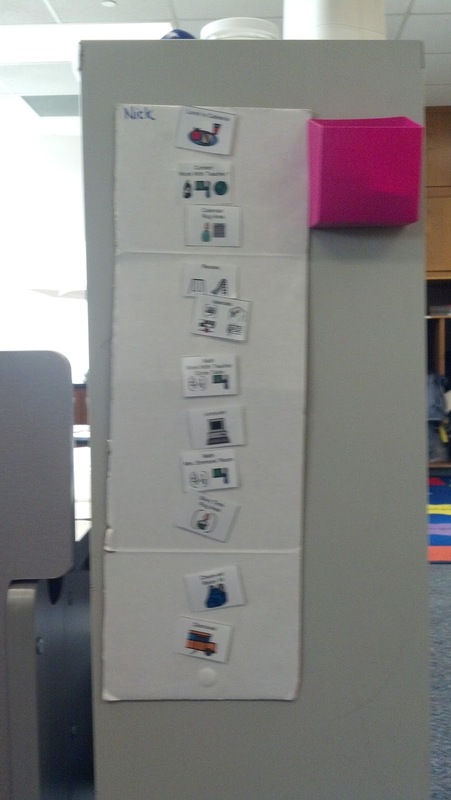 For kindergarten, I use several different assessments to see where they are. 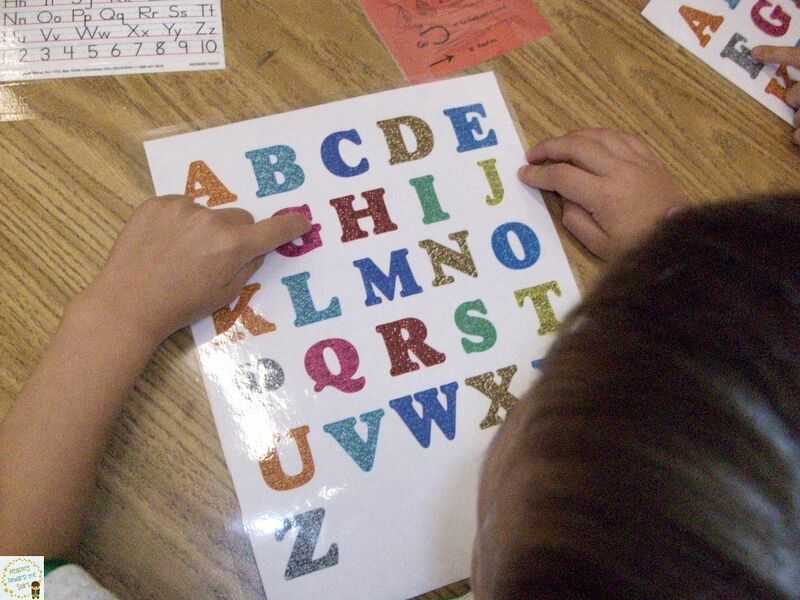 Alphabet Tracking ~ An easy thing to do with kindergarteners is to have them track the alphabet. I give a them a sheet like the one below and say the alphabet with them as I watch. If the student is unable to track the alphabet, I show them how and then allow them to try again. Sometimes, just understanding what to do is all they need. Letter Identification ~ I use letter flash cards with the students to see if they can identify the letters on the cards. These are out of order, so they really have to know the letters to get this one! As they are telling me the letters, I write down the ones they do not know. 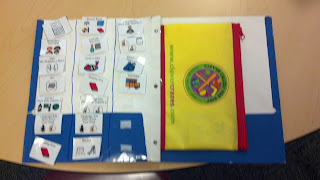 Letter Sound Knowledge ~ Again, I use the flash cards to see if the students know the sounds of the letters. If the students can't give me the sound of the letter, I ask them if they can give me a word that begins with that letter sound. Rhyming ~ I show the students three different pictures, two of which rhyme. The students have to choose the two pictures that rhyme. I say the three words slowly, so they can hear the rhymes. Where is the front cover? Where is the back cover? Open to the first page. I am not looking for the students to be able to actually read, but I want to know what they know about books and print. It is fascinating to see! I did this with my son when he was two, and he know sooo much more than I thought about books, just because I read with him every night! Writing ~ I simply give the students a pencil and some paper to check grip. I then ask them to write their name. This gives me another insight into their knowledge. I look to see if they open it to the beginning of the book and go from left to right. There are many more assessments I could use, but at this point in the year, this baseline data gets me enough information until the students are assessed by their teachers. Hey Everyone, Lisa here! I'm so glad you've been enjoying our Tips for New SPED Teachers series! Now through August we have a whole new set of ideas for you! Now you get to see our best ideas for the beginning of the year with our "Back to School with the Sparklers" series! Please email me using the contact form if you have a specific topic you'd like to see in this series! HEATHER is going to get us started with a great post about visuals! So keep on reading! 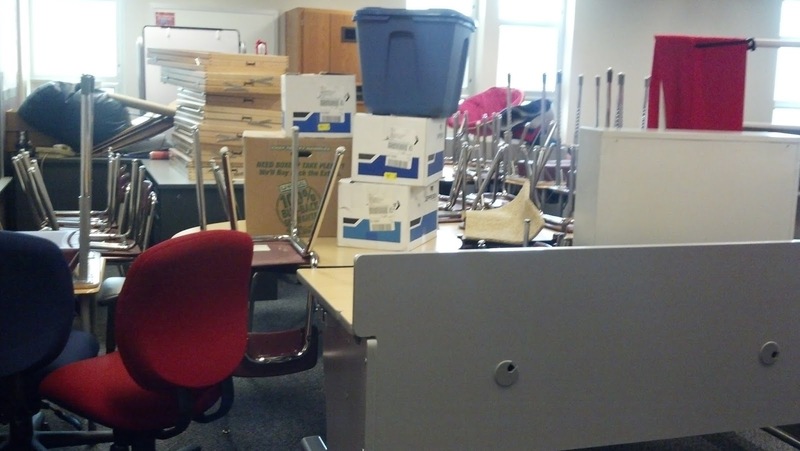 Are you preparing for the 2013-2014 School Year yet? If so, what visuals do you have prepared for your room? I want to share some of my favorite visuals that I always have on hand, just in case. I find myself pulling them out often. For Time Management, I pull out my countdown and my stoplight visuals. The countdown allows you to tell a student that they have a set number of tasks to complete before being finished or earning something. As they complete a task, you remove the top number to show how many are left. 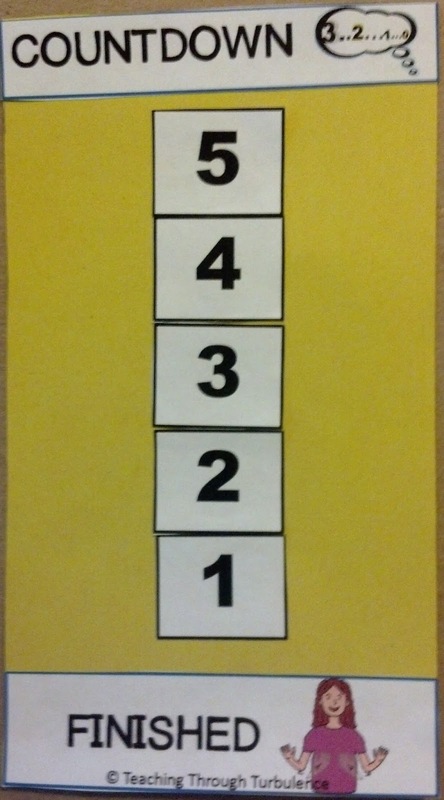 If you put a strip of Velcro on the front and back, you can easily place the numbers there and then move to the back as you take them off. With the stoplight one, you control the amount of time left. Visual timers are absolutely wonderful, but what if you aren't completely sure the exact amount of time until you are going to the convocation or until that guest speaker is coming? You control the time by showing green, yellow, and red. Then you remove from the top down. I always start by showing all 3, so they know what comes next. Do the same thing with the Velcro on front and back for this one also. Another thing that I always have ready is an "I'm Working For..." Chart. 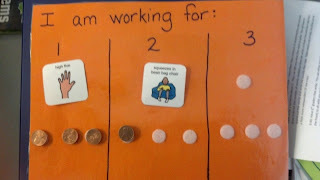 With this chart, the student earns some type of token on a chart (I use pennies,but you could use stickers or anything that the student would like). Once they earn a set amount, they can earn some short privilege. In my room, they would earn high fives, tickles, hugs, bounce on the ball 5 times, jump on the trampoline 10 times, and squeezes in the beanbag. These are super easy to make on your own. If you have access to Boardmaker, I use pictures off of there and just make it on construction paper. 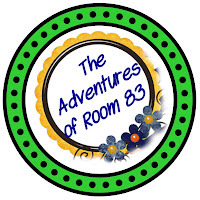 I do have a cheap version with cute clipart from our very own Lisa Parnello. You can check it out by clicking here. These are mine that were made with Boardmaker pictures. This one is used for multiple students at one time. 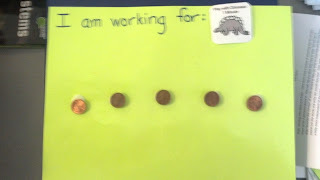 Each student has to get 3 pennies to earn what they picked prior to starting. This is for one person. This is what the back of both of them look like. The chart for only one child just has less pennies. I use Velcro dots for the pictures and a Velcro strip for the pennies. I always have Turn Taking cards ready to go also for those kids that need a visual to wait their turn. I put a green on one side and a red on the other. Most of the time I give each child one that says "My turn" and "Wait" on them. 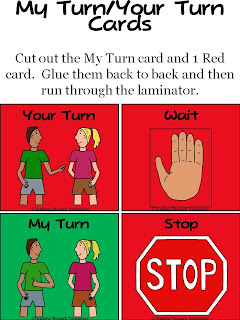 The child is responsible for turning their card green side up when it is their turn and then red side up when they are finished with their turn. This cues the next person that they are finished with their turn. You can also just use one card and have a child use it to show "My Turn" and "Your Turn". 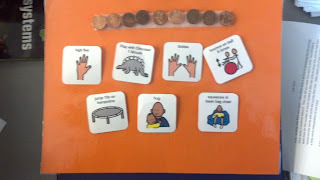 I will use these sometimes when I am teaching to show a student that they are waiting and that it is my turn to talk and teach. Guess what? 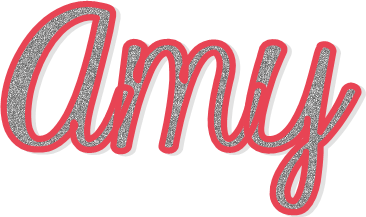 Another freebie for you! 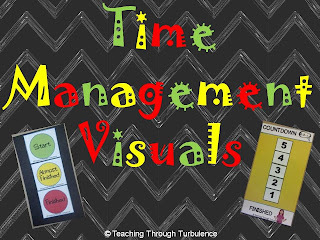 I make many different visual schedules to meet the needs of each individual student. These are some of my go-to visuals. What visuals do you always have on hand in your room?? Here is the mess that I start with each year after they have cleaned the room... it gives me a bit of anxiety! 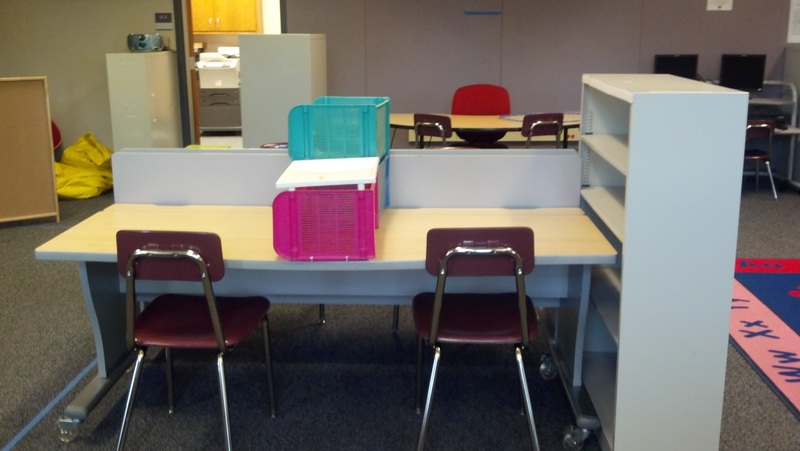 Work With Teacher Areas: These are tables that are usually set near a whiteboard or some type of teaching area that the students use when receiving instruction. 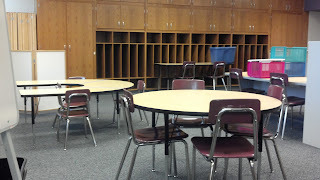 I had 3 Work With Teacher Tables in my room this year (since I had 3 adults teaching). These tables did move from this original set-up. I had a smaller kidney shaped table on the other side of room that was mainly used for my primary students. Work Alone Areas: These are tables or desks that students would use to complete their independent work. 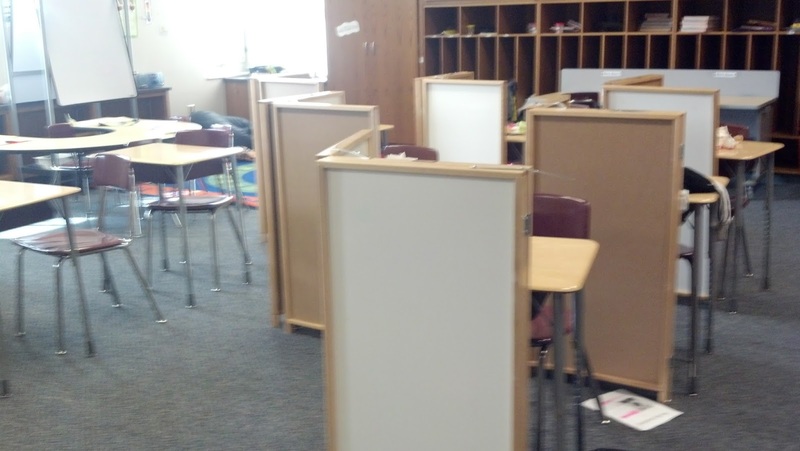 I started the year with tables that were separated by tape into 2 sections for the students. There were trays and crates that were used for the work that needed to be completed and then for the finished work. 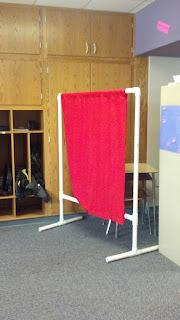 I absolutely love this set-up, but I had too many students to work through this. 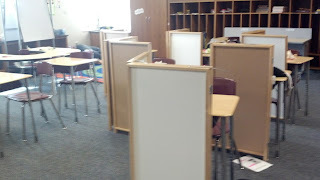 My students also really wanted their own personal space, so many of my older students moved to desks in the middle of the room. 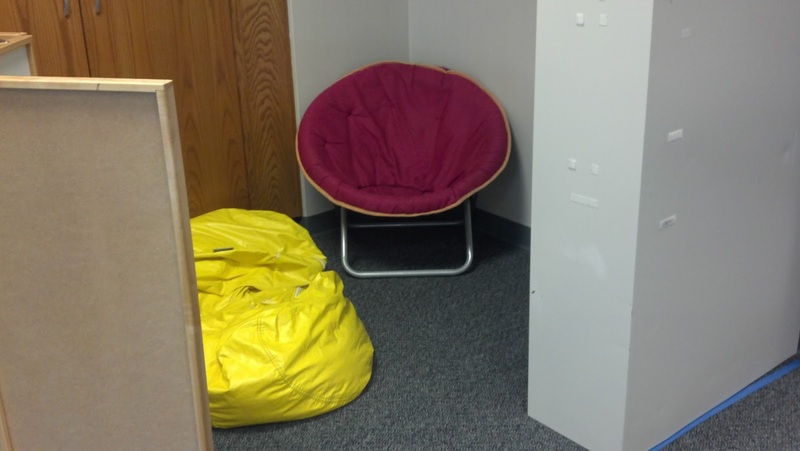 A Safe Spot: This is an area that students can go to self-calm. You can use a variety of objects to make the boundaries of this area. I also put many visuals that the students need. (The visuals aren't pictured here though). Computer Area and A Rug Area (2 separate thing, but both in this picture). The rug area is used for Calendar. You will also see a teacher's desk in front of the door in this picture. I had runners at the beginning of the year. This was a physical barrier that slowed them down because it was a smaller area to walk through to get to the door. 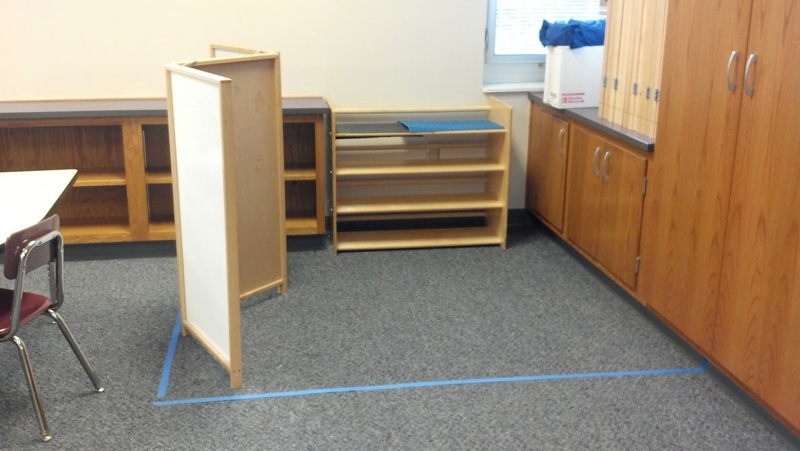 Students also were able to check-in and out at the desk and bookshelf. We eventually moved this desk away from the door, when the barrier was no longer needed. 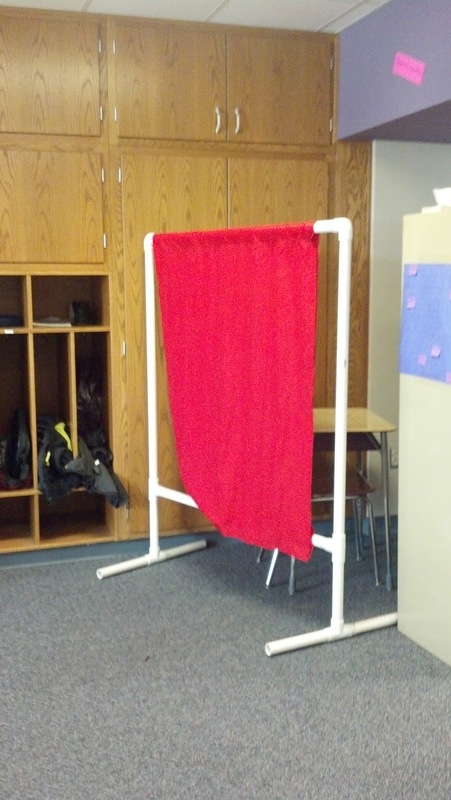 Leisure Area: This is an area for teaching about leisure and for Social Skills time. Some kids with special needs do not know how to pick out and complete leisure activities. We would teach that in this area. We would also teach social skills, such as playing together and taking turns. Notice the tape on the floor is a visual boundary. Different toys were put out on the shelf for kids to play with. Even though things moved around or changed the type of furniture, I always kept these areas in my room. It was a good mix of areas for me to be able to manage students that were with me all day and those that came in and out. 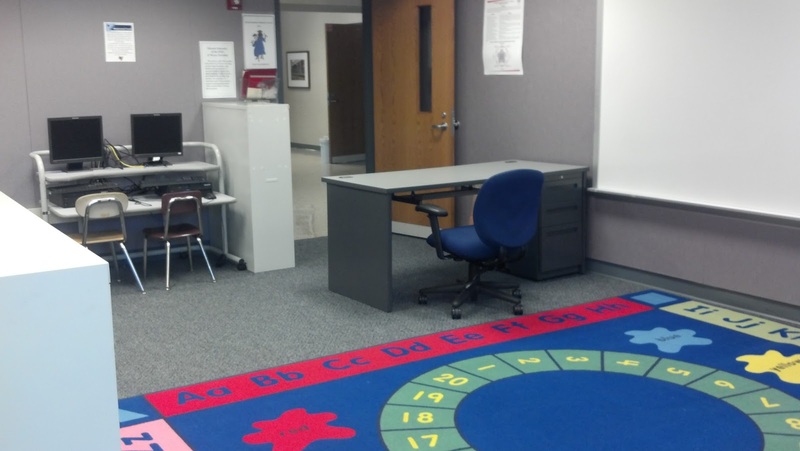 What additional areas do you have in your classroom? 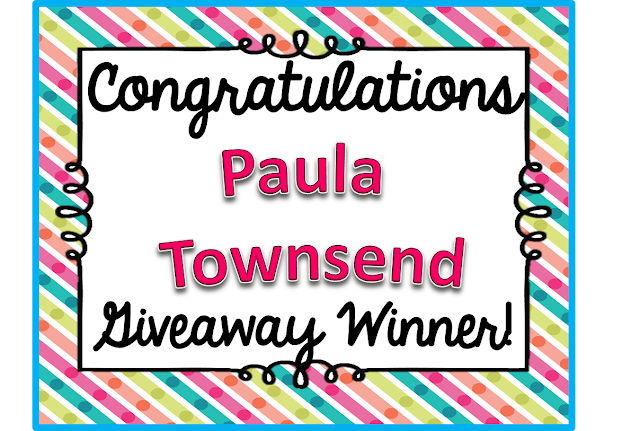 Thanks to everyone who stopped by for the Carson Dellosa Giveaway! We appreciate all of our readers, we are so glad you are here and hope you're finding lots of helpful information for your students! Special thanks to Carson Dellosa for sponsoring us and providing great products for kids with special needs. I've sent you an email and you should be getting your prizes soon! 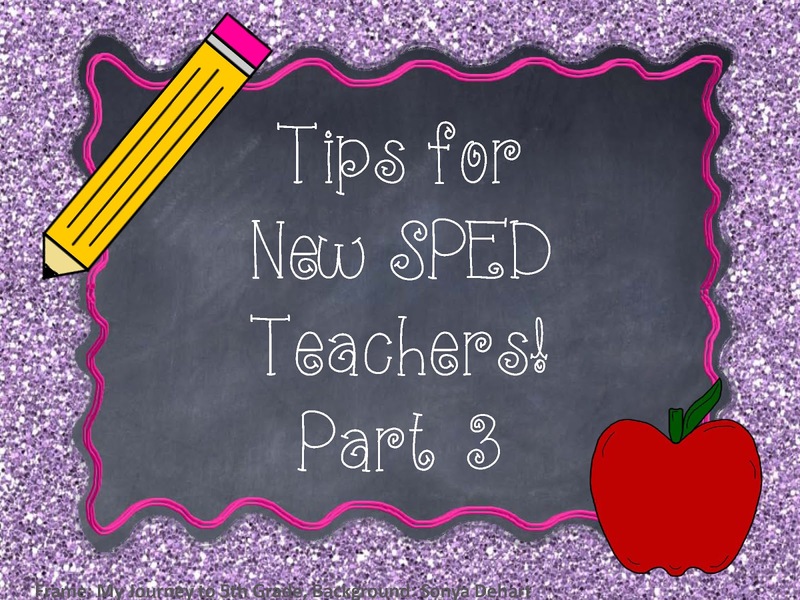 Stay tuned to our blog for lots more new teacher tips and back to school posts coming soon! 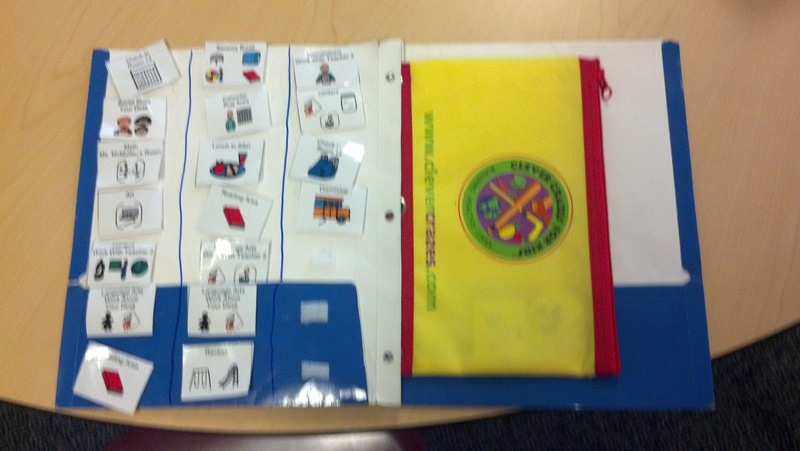 At my school, I use my lesson plans to stay organized and to show that I am working towards my students’ IEP goals. In most counties, lesson plans are a requirement and are checked often by administrators. 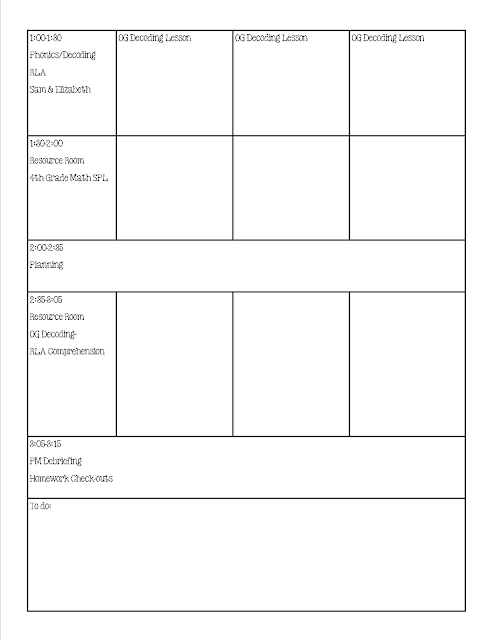 Although my lesson plan format is tweaked often because of new services being altered through annual IEPs, I usually stick to the same type of format throughout the year. 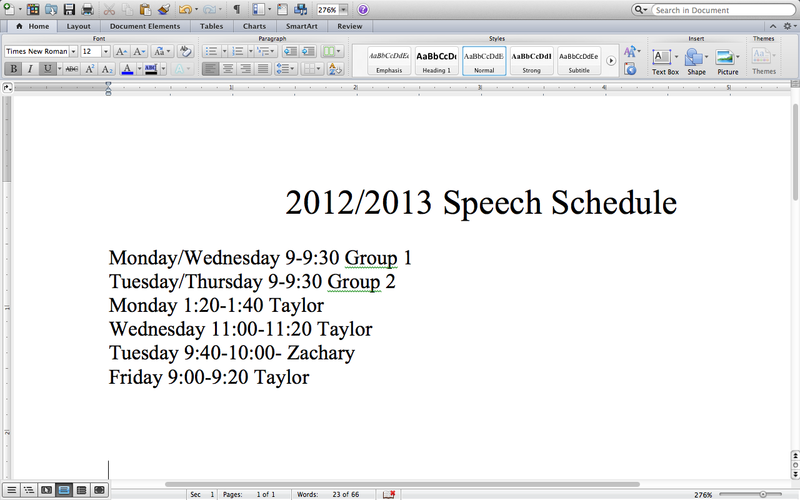 I create these templates as soon as my schedule is set in stone. I have a few e-mails about lesson plans on my blog, so I figured other new SPED teachers might be wondering the same thing! 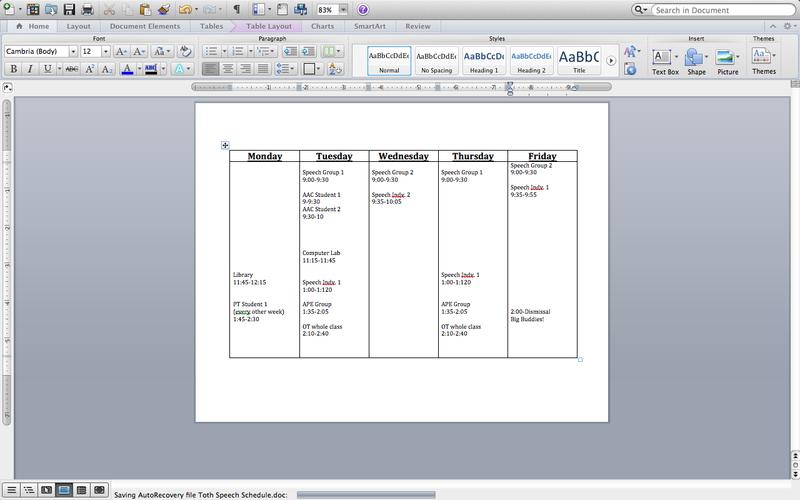 First I make my own week at a glance lesson plans that look something like this. These are typically the lesson plans that I carry on my clipboard throughout the day. I like that I can see the whole entire week, and I usually just type in and have a lot that stays pretty routine weekly, such as "OG lesson number ___" and I just fill in the info quickly as needed! I also make a daily routine checklist to carry with me so I am sure not to forget any of the little daily to-dos. 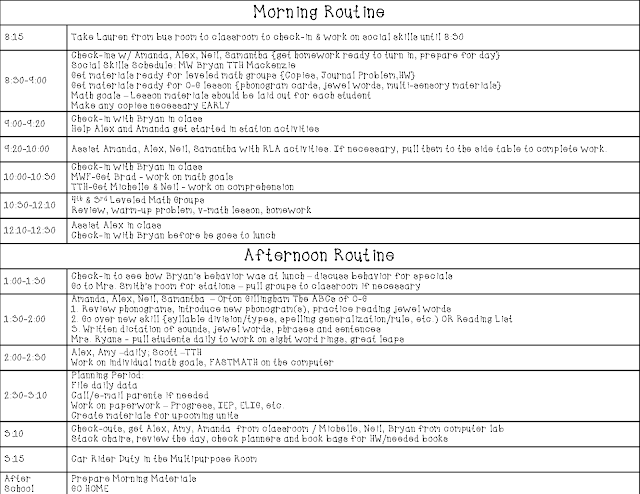 This routine checklist is also good to have on hand for substitutes. 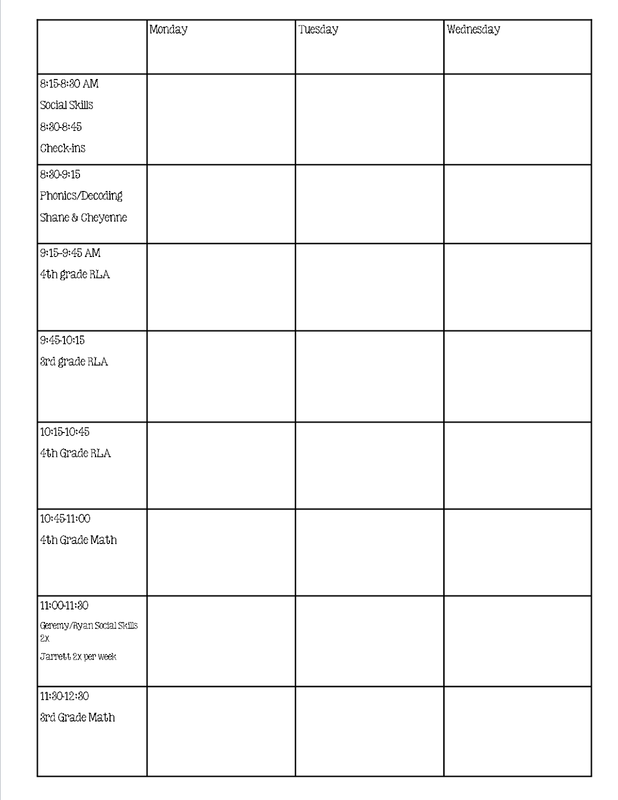 Something I create at the beginning of the year and leave in my lesson plan binder are my class-focused lesson plans. 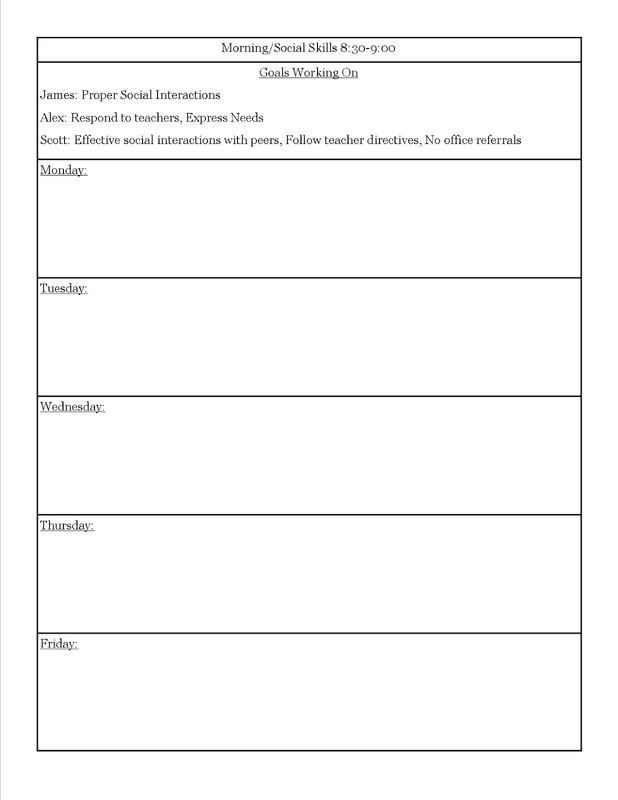 These focus on one particular time period during the day and the students who are present in the class at the time period and their individual IEP goals I focus on during that time. THESE are the plans I leave for my substitutes, as they have much more detail than the full week’s view. 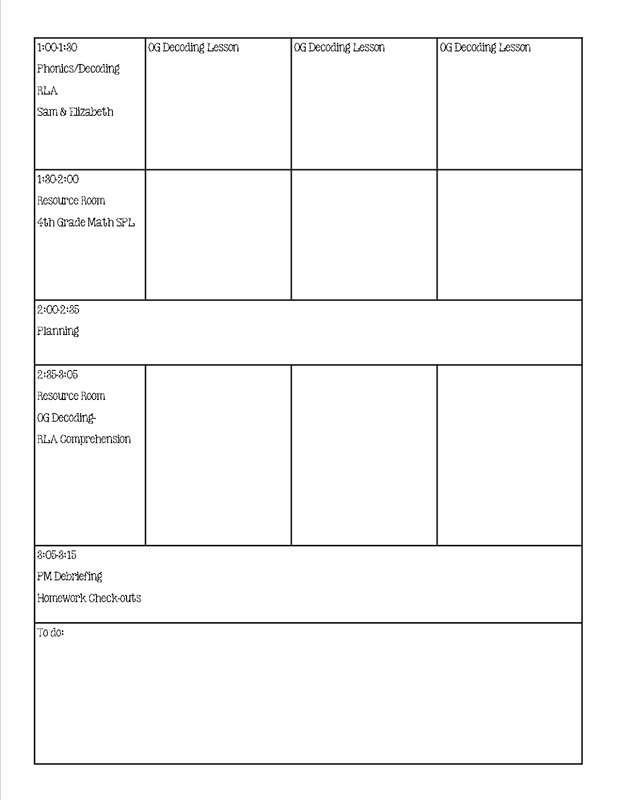 I have found that with lesson plans, you just have to find a format you like and make it fit your needs! I would absolutely adore to get an Erin Condren planner, but it is just not possible with the SPED scheduling frenzy! One of the most daunting things in special education is all of the very formal reporting! We see a couple random examples in college, but it's something I feel many teachers aren't really trained to understand how to read before starting their careers. You see them, but they rarely make sense before you've had to read one that actually pertains to our own students. I'm here to hopefully help you make sense of it all! Note: I am not a doctor or clinician. I am a teacher with a Master's in Special Education. I'm telling you how to get to the basics for those who are new and worried about all the paperwork. There is soooo much to these reports, but I don't want to overwhelm you. I want you to know where to start. When there are 50 pages in a file by the time a kid reaches 1st grade, these files can get very thick and daunting before you've ever begun! You have to find the important part and start there! Find the most recent IEP, read the 1st page that says the key student information: age, disability category, severity, etc. Look at the scoring tables within the report that show the percentile rank (%tile). Look for any section where the student has a score of 50% or lower. Those are the areas you need to focus on! If the student has a severe disability, that could be every section. In that case, focus on the lowest numbers and know those will be the student's greatest challenges. Skip to the end and read the qualified services section. This will tell you how many minutes you should be providing specific interventions, or allowing for therapies such as speech and OT. It also tends to include approved accommodations and modifications for class work and tests. Then skip the final pages and find the IEP goals. 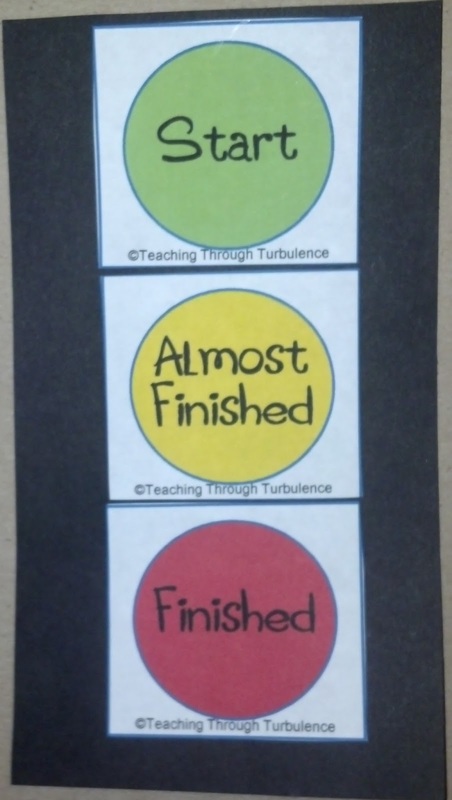 This will tell you exactly where the student is starting (Baseline) and exactly what the goal is for the student to learn in that area. There are often a mixture of academic, social, speech and OT goals. Find food allergies and diet information!! Students in special education have an exceptionally high rate of food allergies and special diets! Most special education teachers have a minimum of 5 kids on their caseload and I've had friends with upward of 100 if they are doing pull-out services. It's best if you have a quick cheat sheet for each child. Here is the link to mine, but use whatever makes sense to you. I currently have 10 kids on my caseload, so Lauren (my co-teacher) and I filled one of these out for every kid tonight. We sat on the floor of the office until 7:15 tonight working on them. It was totally worth it to help us make a plan for each child. Sensory Processing Disorder- trouble processing information, generally physical things such as sound (volume/tone), smells, tastes and touch. 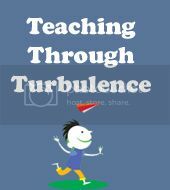 Students usually crave or repel from different sensory things, which can vary greatly by child. Sensory seeking often means they crave touching/feeling/chewing or other sensory activity more than the average child. Auditory Processing Disorder- trouble understanding verbal/audio information. This can result in very slow response times between you asking a question, and the student being able to answer. It also results in poor auditory comprehension (remembering a story read aloud to them). Perseverate- Get stuck on the same idea/topic and struggle to change topics despite the fact that it is inappropriate for the audience or situation (i.e. constantly talking about trains during reading time, recess, AND math). Social Skills- ability to interact appropriately with peers and adults. This includes making friends, maintaining appropriate personal space, solving social problems appropriately, and theory of mind (understanding other people have different thoughts than yourself and may not know what you know). For example, poor social skills could include a student who likes to play with others, but hits them, as well as a child who'd rather play alone. They are different sides of the same coin. PDD-NOS- Pervasive Developmental Disorder- Not Otherwise Specified. This can take a HUGE range of appearances! It generally means they can diagnose that something is wrong, but can't quite give it a label. This often occurs with students who have significant social skills challenges, but don't quite fit the mold for autism spectrum disorders. Fine Motor Skills- Refers to small coordination tasks such as holding a pencil properly and cutting with scissors. This can result in students not knowing how to tie their shoes at the appropriate age. Gross Motor Skills- This refers to larger movements such as hopping, skipping, throwing, etc. These can often be seen in PE class. Jumping jacks can be very hard for some students! 1. Put the time in up front. As we talk about the need to set up the classroom, make the schedule, and everything else that needs to be done, we sometimes forget to talk about why putting the time in at the beginning of the year is so important. I know that in the midst of all the meetings and professional development that are scheduled before the students start, time gets squeezed pretty tight. However, the more time you put into organizing the classroom now, the more easily things will go as the year progresses. 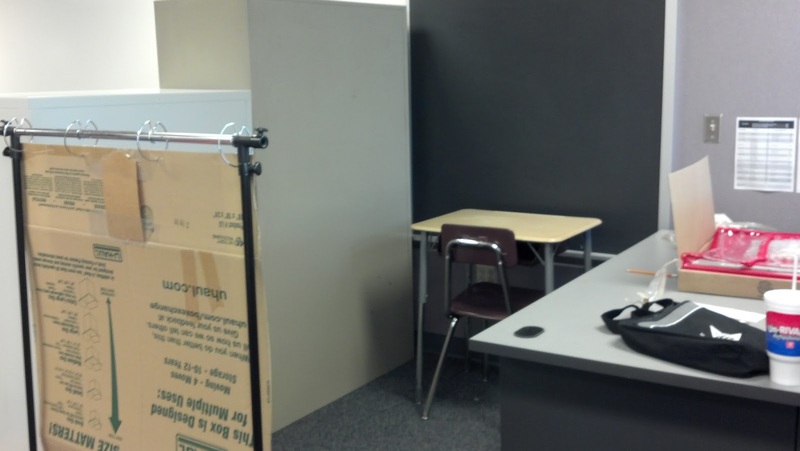 I set up multiple classrooms every year. Some I set up new. Some I reset because they have been struggling. Often it's because they weren't set up effectively to begin with. The time you spend making your class schedule, your staff schedule, setting up your physical environment and developing instruction for your students is the basis upon which everything that happens throughout the year will rest. You may make a plan and throw it out after the first day, but it will give you something to come back to and make changes. 2. Get to know your students. I know there are teachers who like to get to know the students in person before reviewing their paperwork. However, without reviewing their files (including their IEPs) you can't know what you need to have ready for them on the first day to start out successfully. At the very least read their IEPs, their last evaluations, and any medical information that would be pertinent. The information sheet that Lisa shared might be useful for this to make sure you haven't missed anything. 3. Start instruction with reinforcement. Especially at the beginning of the year, start out by getting to know what is reinforcing for your students. There are a variety of ways to do this, but the easiest is just to pull out things they might like and see what they do. This serves two purposes. It helps you figure out what might motivate them and it associates you with things they like. Associating yourself with reinforcers means that you become reinforcing by yourself and eventually the extra stuff can be faded out. It's a great way to build a relationship and start out the year. 4. Make sure you have the required equipment. As you review your students' files, highlight the items you need to have to support the student's program. 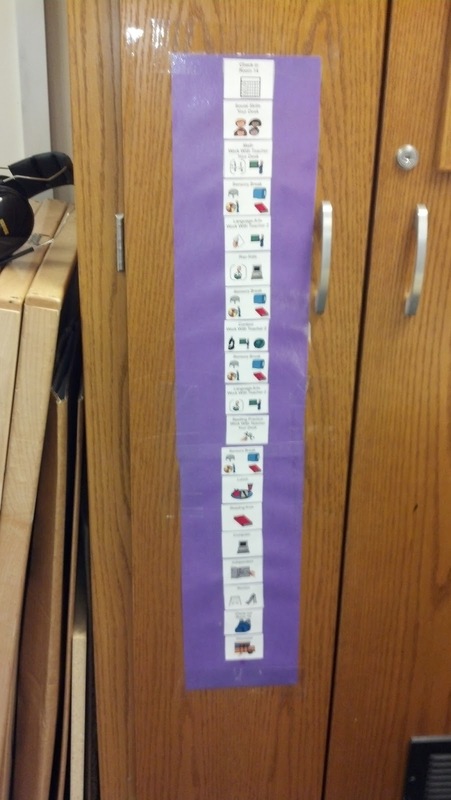 These might include a communication system or a speech-generating device for a student to communicate. It might also include a specific curriculum (although these often aren't included in IEPs). If he was using a specific reading curriculum, find out where they left off last year. Don't know where it is, track down last year's teacher or the ESY teacher. If it's in the student's IEP, you need it to implement his program. Similarly if you don't know how to implement the strategy, the curriculum or use the equipment listed in the child's program, find out before the child gets to school. I know it seems like a lot to do, but it goes a long way to building respect from administrators and trust from families that you will do what the student needs when you make this type of effort. 5. Problem solve. Caitlin's post about paraprofessionals pointed out how important they are as members of the team. Sit down at the end of the first day, with them and any other people involved in the class, and talk about what worked and what didn't work. Do this for the first few days of school at least so you can tweak things to get them off to a smoother start more quickly. Solicit that information from the others working in the room because you can't be everywhere at once. Then decide to try a change and talk about whether it worked at the end of the next day. 6. Write it down. To facilitate the problem-solving process, keep a pad of paper (or your information recorder of choice) somewhere in the center of the room and write things down that you think of that you need to make, that you need to change, or just that didn't work. Encourage all the staff to do this. When we set up a classroom, we do this the first two days we run it and then use that list to help the problem-solving. Whatever happened at 9:30 in the morning will not be as memorable at 3:30 in the afternoon, so keep a running list. That way it's also easier to divide up the tasks of what needs to be done to be ready for tomorrow. What other tips do you have to offer new special ed teachers or what questions do new teachers have? Share them in the comments! Looking at IEP’s can seem very overwhelming. 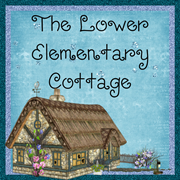 While a well-written IEP can tell you a lot about a kiddo… it will never tell you everything. With that being said, you do not want to plan a years worth of curriculum, even two weeks worth, until you have spent a few days with your students. Most importantly, you cannot set up your daily schedule until you have all of your specials set up. Here are a few tips to setting up your student's services. 1. Make a master list. Review each IEP and make a list of each service. Be sure to note minutes/week or month and whether it is individual or group. Review each IEP AGAIN and a 3rd time to make sure you didn't miss a service! Also- note any amendments or pending assessments from last year from the minutes page of the IEP. Be sure to review each minutes page of the IEP. 2. Schedule Group Services. I try to schedule my group services first. 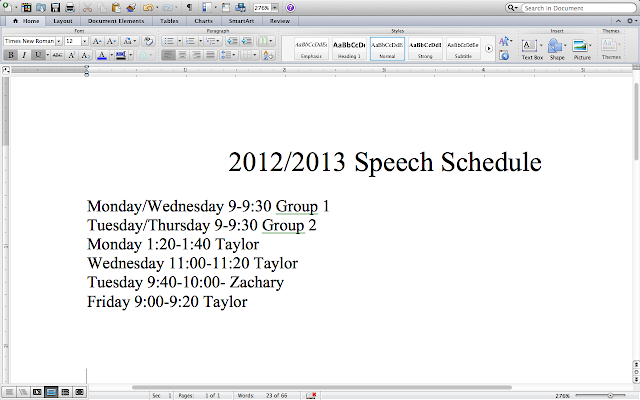 For my class, Speech and APE are the biggest services my kiddo's receive. I like to start with these services as they take the biggest chunks of time. 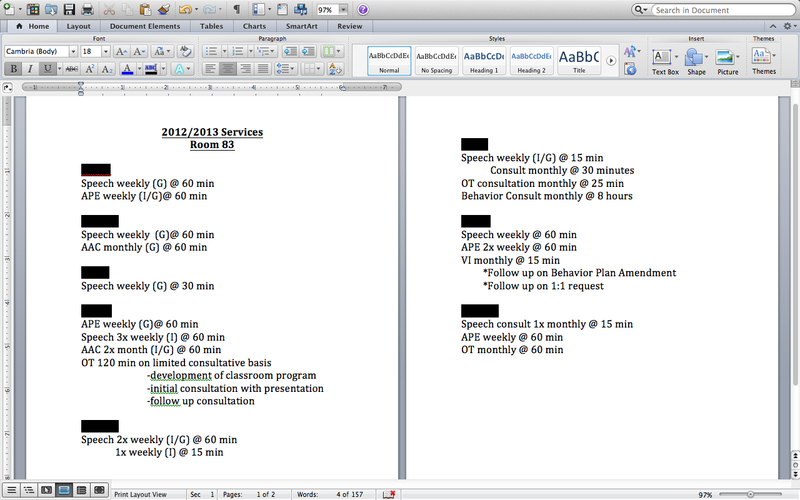 I would advise to schedule your services from the most time to the least time to reduce scheduling conflicts! 3. Schedule Individual Services. When scheduling individual services, consider what time of day is best for that student. Also- consider the transition time for the student to get to the service provider location. I like to set my individual service times for either first thing in the morning (straight from bus), at the end of the day (walk straight to bus from service) or before/after recess and lunch. Any time I can reduce the transitions... the better! 4. 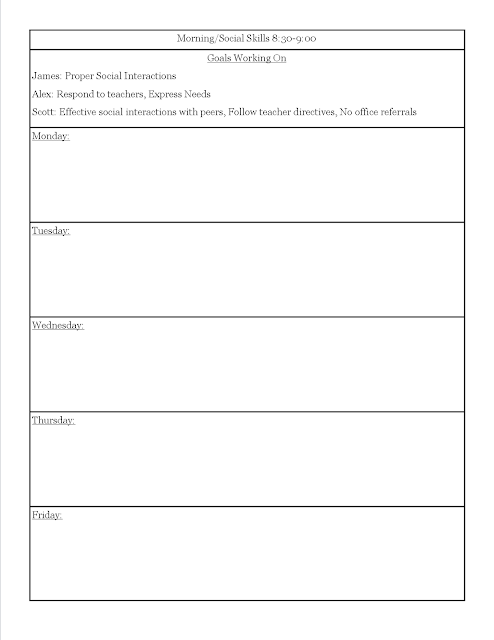 Create a master weekly schedule. POST THIS EVERYWHERE! I post this on my schedule board, by the door and a tiny version on the back of my I.D. tag so I can see it when I go out to get my kiddo's from recess/lunch. By making a weekly schedule like the one below, it is easy to look at it every morning when setting up your daily schedules! 5. Be sure to thank your service providers (and your bus drivers too!). I love my service providers. They take such good care of my kiddo's! I am blessed to have a great special education team in my district. We are able to collaborate, text and email each other and get immediate responses. We have a solid team and it makes working that much better. Be sure to thank your service providers. During holidays, end of the year, birthdays etc., be sure to send a card/gift their way! They work hard and deserve a thanks every once in a while. I love to make a huge class card and laminate it with a class picture. This way they can put it up in their office! A little bit of thanks goes a long way!